※ [Limited] Beatrice & co. Envelope contains resumes from Beatrice and Ferris inside. ※ [Limited] Fairy's Sweet Appul Sake gives one more daily draw when used. On the special event site, every day there will 8 chances to recruit from the collaboration employees [Emilia], [Rem], [Ram], [Crusch], [Ferris], and [Beatrice] and other popular employees! A max of 2 employees can be recruited! ※ The present you receive will be available as long as you link your twitter account before the 12/21 (Fri) maintenance. ※ Selected employees will be added directly to your account on the 11/30 (Fri) maintenance. If you link your account between 11/30 (Fri) and 12/21 (Fri), the employees will be added to your account after the link. ※ Using multiple twitter accounts for this campaign is not allowed. ※ If you are found to be using improper methods for recruiting, any employees gained from this campaign may be deleted. 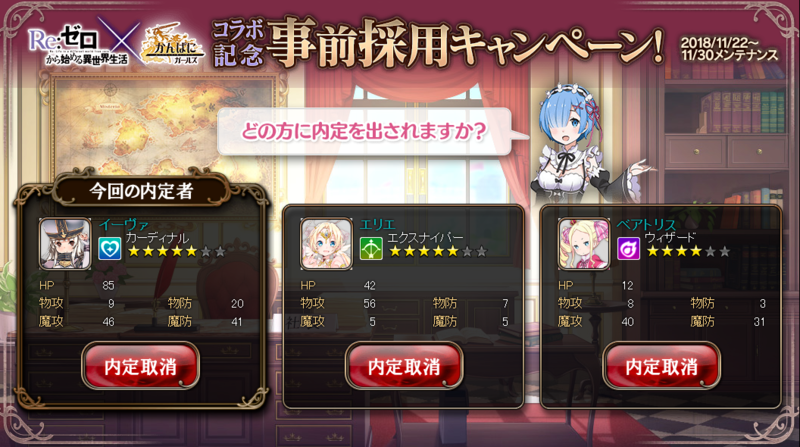 A chance to receive the ★5 Collaboration Employees [Emilia], [Rem], [Ram], or [Crusch] !? Five lucky winners of the lottery will receive one of [Limited] Emilia's Envelope, [Limited] Rem's Envelope, [Limited] Ram's Envelope, or [Limited] Crusch's Envelope to guarantee recruiting a collaboration employee! 2. Retweet the stickied tweet. ※ Winners of the lottery will receive their presents in their in-game mail. ※ To receive the present, you must have your twitter account linked to your game account by the end of the lottery. Last edited by Folseus; 11-22-2018 at 01:10 PM. Is Pre-Recruit Campaign only for new player? Last edited by oryxlynx; 11-22-2018 at 09:14 AM. no wait, are those three ways to participate? or we have to do all three? Last edited by Fiir-chan; 11-22-2018 at 11:09 AM. @Folseus How to link Twitter account with Kanpani btw? Last edited by Mikan; 11-22-2018 at 01:25 PM. The ★5 rate is probably the same as a regular draw with no postbox honestly. This means like 0.026% if they don't have a rate up too, or 0.4% if they have a regular rate up.